Seven months after the Green Poison turned New York into a disaster area, the Strategic Homeland Division is still hard at work… shooting A LOT of people in the name of rebuilding infrastructure and keeping the government in power. When their main network goes down, the Agents of the Division receive a distress call which takes them to Washington DC. The capital, in shambles and held hostage by three warring factions, is in danger of falling completely, and your Agent is the city’s, nay, the country’s last hope. It’s some ridiculous schlock to be sure, but this is the picture Tom Clancy’s The Division 2 paints with the loose freewheeling precision of a Bob Ross enthusiast. The looter shooter sequel to 2016’s mostly milquetoast Tom Clancy’s The Division, Ubisoft manages to deliver an experience that learns from most of the mistakes of its predecessor and is a good game in its own right. For those of you not familiar with Tom Clancy’s The Division, allow me to break it down for you using gaming jargon: third-person, open world, looter shooter. In other words, you run around, in this case Washington DC, and shoot enemies, who drop loot that adheres to the widely accepted Blizzard Item Quality Color Scale (Gray, Green, Blue, Purple, Orange). Scattered across the open world are safe houses and settlements that serve as respawn points, while the main base of operation, where you can craft and level up your skills, is housed within The White House itself. Except for the location of the Base of Operations, the core of The Division has remained the same. Where Ubisoft has made improvements is in flood of content that delivers that core. My time in The Division 2 was split between scripted missions and a variety of open world activities. The scripted missions are absolutely fantastic. All of them, whether considered story or side, are both capable of being soloed and allowed for matchmaking, as the difficulty and the amount of enemies scales with who you bring in with you. As a mostly solo player, I found the content to be challenging but not impossible, but I absolutely felt like I had more fun joining up with random players or jumping into a team with friends. The Division 2 makes finding a group easy, with each hub offering a matchmaking point for random content, while moving up to the start of a mission itself will allow you to recruit players for that specific piece of content. There’s also a flare system, much like in Monster Hunter World, where you can put out a call for help and players can join up and then warp to your location. I didn’t have a whole lot of luck with this style of matchmaking, as I found that any random calls I put out went unanswered for longer periods of time than simply using a hub or pulling players in for a mission directly. 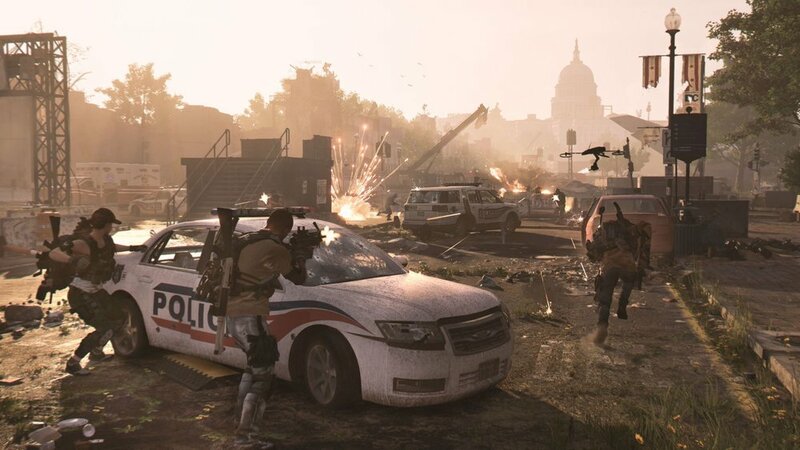 Where the first Division did OK with its environments, The Division 2 really stretched what you can do in the heart of a city like Washington DC. Gunfights in the Air and Space Museum, a settlement built on the top of a Theater, open fighting around the Washington Monument and the downed, broken fuselage of Air Force One are just random examples of the design on display. Despite mostly taking place inside of buildings, I never felt like the assets were being reused, and the areas planned for the boss fights do a great job of adding to the tension of the battle. The large faction Strongholds that cap off the story feel immense, and the final standoff at the Capitol building, along with the storming of the building itself, are just some standout set pieces. DC does suffer from the same kind of garbage pile up that New York did, with much of the environment covered in literal trash as well as dead automobiles and the like. Hidden among the refuse are a variety of lootable objects, and while there are not as many lootable internal areas, the ones that are present feel more organic than New York’s seemingly random brownstones and apartment buildings. The three factions that make their home in the open world, the Hyenas, the Outcasts, and the First Sons, have made notable locations into armed checkpoints that you are able to reclaim, granting some additional options for fast travel as well as trying to add to the ambiance of bringing some order back to this lawless world. There are also random events, like the oddly ubiquitous propaganda speakers, citizen executions, and smaller areas of controlled territory that can all be completed for additional loot. The best part about all of these smaller pieces of content is that you always feel like you are earning something, whether that be experience to level up, crafting materials for use back at the BoO, or just general weapon/armor loot to improve your character. Nothing feels wasted, and the differences in available activities ease the grind that this type of game eventually turns into. A special call out has to be made here for the Enemy AI design. 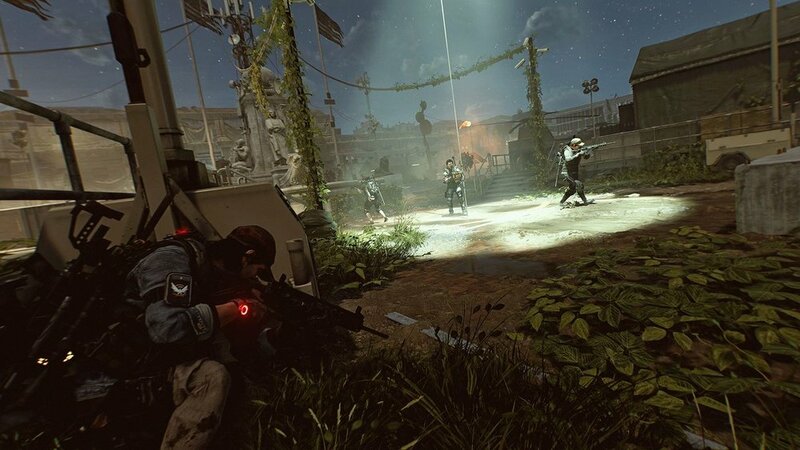 Where the vast majority of The Division could be played crouched behind a single piece of cover, the enemies of The DIvision 2 have learned what flanking means and know how to use that knowledge to make you suffer. The amount of times I was blown up in the open world because I lost track of an Outcast, or was shot in the back because I paid too much attention to the brazen Hyena strutting towards me while firing an uzi, or literally died running because I saw the flank maneuver coming but was totally under fire by a True Sons mobile machine gun nest number high enough to give me agita just thinking about it. Enemies are smart and not afraid to hang back and just drop grenades on your position, and while even the flimsiest cover still makes you nigh invulnerable, leaving cover for even an instant while under fire is a scary proposition. Helping you deal with this improved AI is a whole suite of skills, ranging from the defensive, like drones that repair your armor or shields that outright mitigate damage, to the offensive, such as rover grenades that track enemies behind cover or even a chemical spray that can make the very air ignite when an enemy fires their weapon. While a lot of the skills appeared in the previous game, everything has been retooled to feel and work better… with one exception: the pulse scan. I used the pulse scan a lot in the first Division. I enjoyed the range and it highlighting enemies, as well as the damage buff it placed on them. The new pulse does all those things, but the range feels so limited that I found it exceedingly useless in most firefights. Thankfully, there are multiple options for each of the skills, allowing you to find the one that fits your playstyle best, and you may get some mileage out of the pulse that I didn’t. With the shooter part sufficiently covered, I’d like to take a moment to talk about the loot that’s dropped and the loot that isn’t. The majority of items you get fall into one of two categories, they are either items you can wear, i.e. weapons/armor/cosmetics, or crafting/environmental items. The weapons and armor hew very closely to the modern military aesthetic; weapons are either some kind of rifle, machine or shotgun, with the occasional side arm sprinkled in, while armor ranges from body armor to backpacks, with the latter no longer affecting the amount of gear you can carry. Cosmetic gear, like hats, shirts, pants, and shoes, are still available through the looting of items, but their drop rate has been significantly reduced in favor of cosmetic microtransactions available through an in-game store. While I understand that this is now a part of retail games, I really dislike this addition, and yes, I understand that it’s just cosmetics and they have no bearing on the game itself, but there is no reason for this when the last game made the looting of cosmetic items feel so natural out in the world. It’s an attempt to cash in on the player base, and I will never be for this. The final set of loot involved either generic materials used in crafting, or generic materials used as donations. In an effort to make you feel more involved in the world, you can donate found food, water, and materials to the outposts you capture, helping those people on the right side of the law survive in a world that is increasingly lawless. The effort is mostly wasted, as the donation system feels more like an additional checkbox then anything else. There’s no immersion using it, as the world itself, outside of the settlements you upgrade through projects, never changes, and it’s not like there’s a finite amount of items, so you never have to make a choice over just dumping your inventory into whatever area you haven’t donated to yet. Crafting works very similar to the way it was implemented in the original Division: you break down items you don’t want into a set of normal, rare, or epic materials, and put together level equivalent gear to fill in holes you might have due to random loot drops. The only difference comes in the availability of recipes for crafting, the majority of which are unlocked by completing side missions and projects. This fits right in with the “always working towards” something side of the game, and while I was never impressed with what I made through crafting, I appreciated that I had to invest time to get more out of it. With everything Ubisoft has done to make this a better feeling loot shooter, the story of The Division 2 is still hot garbage. The majority of it exists in the fringes of the work you are doing, with the more interesting bits living solely in the form of unlockable audio logs or the video logs that unlock after story missions. None of these deal directly with your character, your standard silent protagonist with no stakes in the game, an agent with no actual agency, and the few times she is referred to in game, it’s as “The Sheriff,” a call back to the piece used to represent you on your handler’s war table. The Sheriff, while clearly meant to invoke the law in the Wild West, implies that you follow some kind of laws, while your actions in game portray you and the Division itself as more of a collection of Punishers, gathered together, outfitted with weapons, and sent out on to the populace to murder whoever you find that “breaks the law.” There’s no talking, no negotiating, no attempt to give “the enemy” a chance to correct their actions. If you are breaking the law, by which I mean the game marks you with a red health bar, you are dead. Period. Other agents, as well as the President himself, call this out in their dialog, asking you, The Sheriff, the deal out death with the same routine effectiveness that a soup kitchen gives out soup. It’s easy enough to remind yourself that this world Ubisoft has built is suspiciously short of shades of gray, that evil is identified as simply as scanning someone’s health bar, but it just leaves everything feeling empty and left me with no interest to invest in this world outside of the game systems themselves. That’s The Division 2 in a nutshell. A foundation of well-designed systems providing a base for a world no one cares about outside of those systems. This is a game where the grind itself is the context for enjoyment, and while that’s not a bad thing, when that grind runs its course, there’s going to be nothing left to hang your hat on. Thankfully though, the foundation is just that good, and I don’t regret the hours I have poured into The Division 2. If only other loot shooters, released earlier in the year, had learned and applied the lessons Ubisoft did. Whether a big fan, or just someone who is interested to see what all the fuss is about, Tom Clancy’s Rainbow Six Vegas 2 delivers a stellar experience. Needless to say if you have a thing for strategy and shooters, this game will impress both online and off. I would say is one of the few must have games for early 2008. Whether or not this strategy pays off is solely up to the player themselves, but for me, the reliance on convention rather then tackling the subjects raised makes me question whether or not I will continue to explore the world Ubisoft is allowing us to play in.